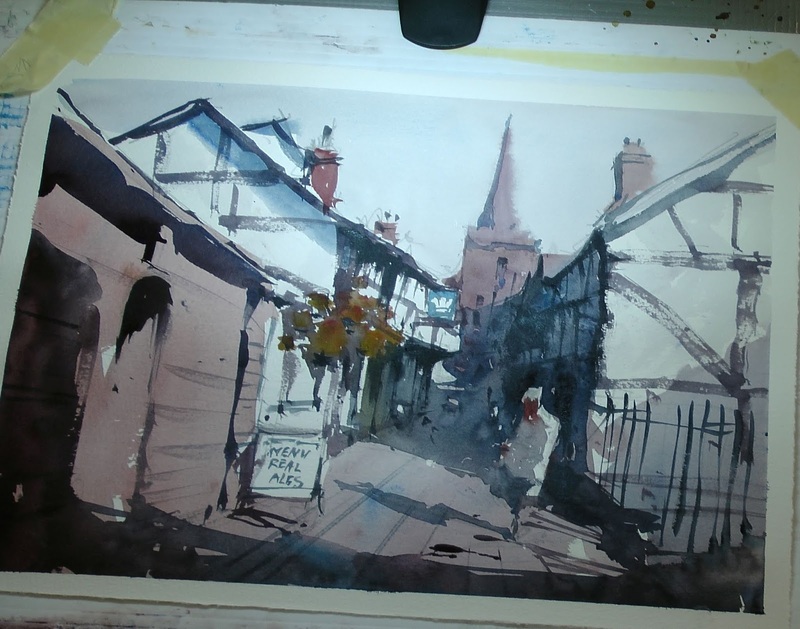 Dartmouth, Devon, 15" x 11"
A demo painting from quite a while ago. The Inner Harbour at Dartmouth in Devon, UK. An exercise in laying down a wash (the water), some careful painting around the foreground boats, composition with the placing of the boats, values (as in the dark of the reflections around the lighter value of the tops of the boats and a nit of looseness (the far boats in the shadow of the buildings). 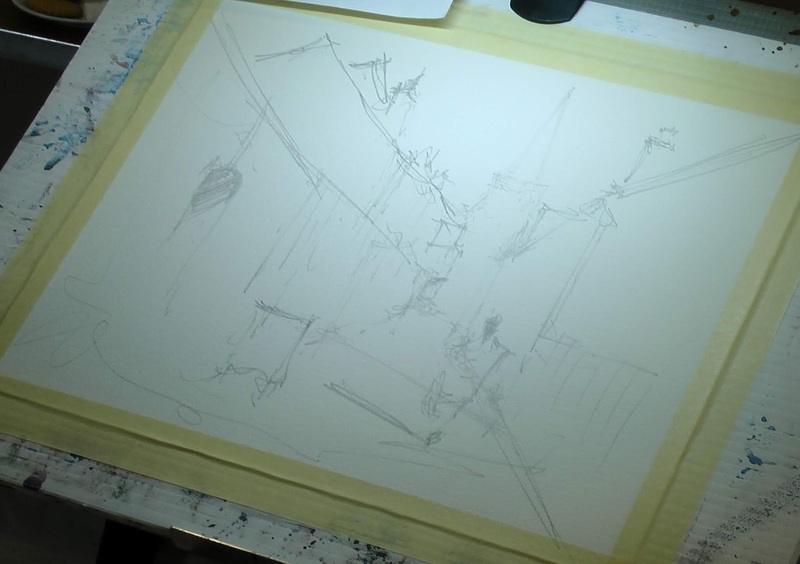 Tim has a very loose style and this enabled him to complete two paintings in less than two hours. Impressive! He brought along two photographs of Ledbury: the Market House and Church Lane looking towards the church tower and spire. 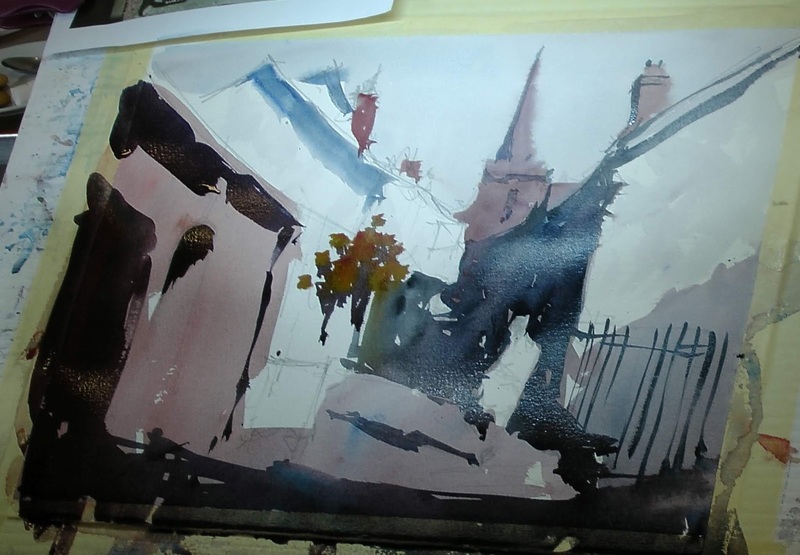 Based in Bristol, Tim specialises in vibrant watercolours exploiting the medium with tone and light. He has painted all his life and is completely self-taught. He loves to paint landscapes and is well known for his harbour and boat paintings. 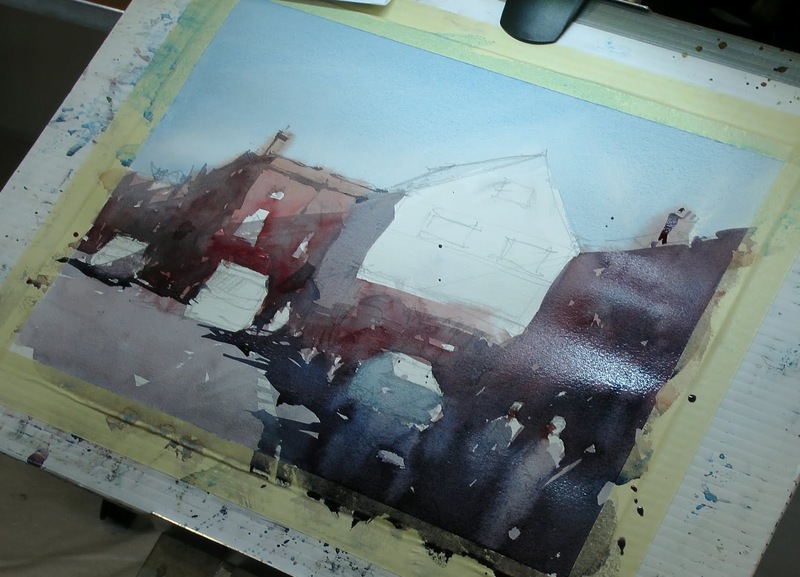 Nearly all his landscapes include figures and cars to give focal interest to the scene. You can see more of his work on his website http://www.timwilmot.com/ His YouTube channel https://www.youtube.com/user/timwilmot has more than 40 full length demonstration videos with commentary. Below you'll find images showing the progress of this and his second painting and also one of his YouTube videos. For both demonstrations Tim used a quarter sheet of 300gsm Saunders Waterford watercolour paper taped around the edges with masking tape. He doesn't stretch the paper so it does cockle a bit as he works but it dries flat. The first step for each was to quickly sketch the scenes using a 3B pencil. 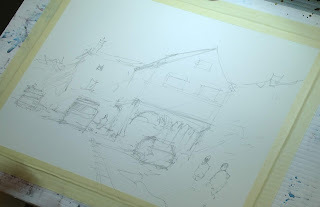 The drawings were kept simple and it was at this stage that he made decisions about what to put in and what to leave out. For instance, in the Market House scene the photograph showed lots of white vans parked between the Market House and the right hand edge of the image, presumably it was a market day, and there were no figures nor was there a van to the left of the Market House blocking the bus bay. 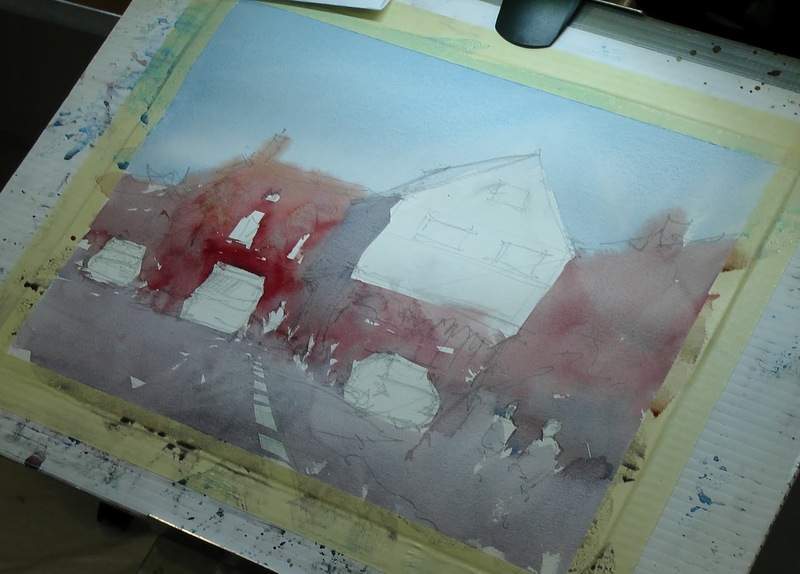 The next step was applying background washes while avoiding the light and white areas. This was done with a large synthetic mop brush. Later he used a smaller squirrel mop and a No. 8 round to add some hints of detail. 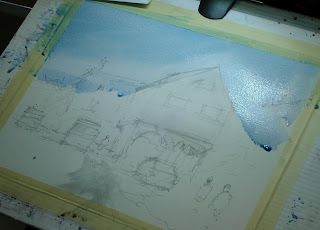 I was fascinated by his palette - Winsor red, ultramarine blue, yellow ochre and neutral tint. He also had a cerulean blue but didn't make much use of this. These demonstrations gave dramatic and lively results. I wonder if any of our members will have the courage to attempt such a loose and dynamic way of painting. I think its worth trying. The experiment will only cost you paper and a little time. Perhaps its worth setting yourself a time limit, somewhere between 30 and 60 minutes will force you to simplify. 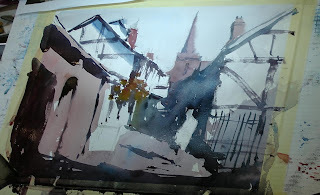 The second painting shows the famous detached bell-tower which sits alongside Ledbury Parish Church. To the left is the Prince of Wales, surely the best pub in the county with its wide selection of real ales. Also on the left in the foreground is the entrance to the Weavers Gallery where Ledbury Art Society holds its exhibitions. Behind the railings and out of the picture is the Butchers Row Museum housed in a timber frame building that used to stand in a row of buildings in the middle of the High Street. Beyond the pub and not visible here is a magnificent timber framed building, formerly a Grammar School it now house the Heritage Centre. 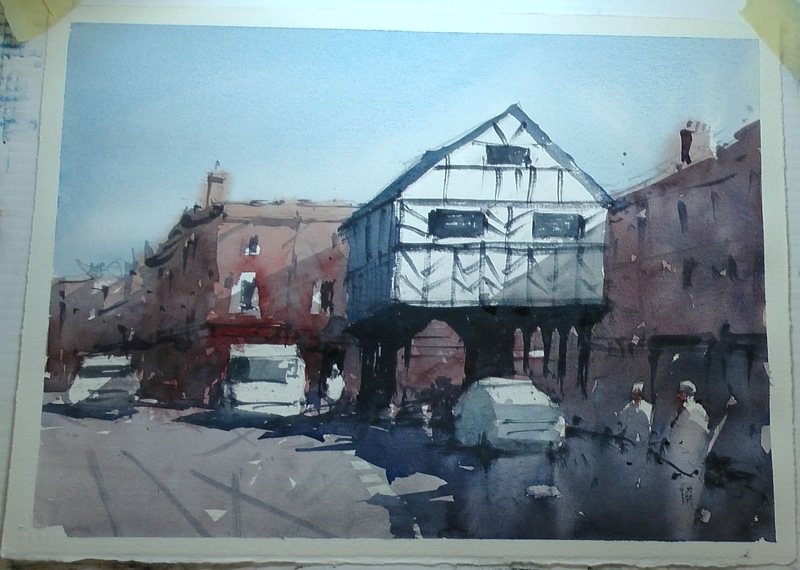 Based in Bristol, Tim specialises in vibrant watercolours exploiting the medium with tone and light. He has painted all his life and is completely self-taught. He loves to paint landscapes and is well known for his harbour and boat paintings. Nearly all his landscapes include figures and cars to give focal interest to the scene. You can see more of his work on his website https://www.timwilmot.com/ His YouTube channel https://www.youtube.com/user/timwilmot has more than 40 full length demonstration videos with commentary. Ledbury Art Society have their annual exhibition in the Weavers Gallery, Church Lane, Ledbury HR8 1DW, Monday 19 - Sunday 25 November. They should have at least 70 paintings on display!